Navy quarterback Zach Abey carries the ball against Army during the first half at M&amp;T Bank Stadium on Dec 11, 2016. The series between the two military academies has a long, storied history dating back to its first game in 1890. 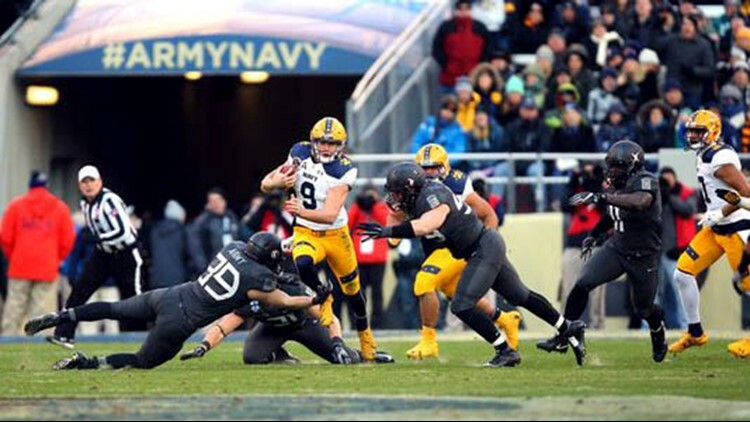 Clearly, the annual Army-Navy football game is an event unlike any other in college athletics. The series between the two military academies has a long, storied history dating back to its first game in 1890. It's been played 128 times, mostly in Philadelphia, but also all over the country, including stops in New York, Baltimore, Chicago and Pasadena, California. The game has featured college students that have gone on to be heroes, generals and even president. Only those who participate truly understand the significance. USA TODAY asked a former player from each team to share what the game means to him. Everyone talks about what they think is the greatest rivalry in college football. Most of these include border wars like Michigan and Ohio State. Or in-state battles like Auburn and Alabama. But nothing compares to the rivalry of Army vs. Navy. People are born to root for one team or another it seems, and this creates great rivalries, but the dynamic that separates Army-Navy is the total commitment of the institutions against one another and then serving together in the armed forces once you graduate. What I mean by that is, it’s not just a football game at West Point. It’s a way of life that is instilled as soon as you walk on campus. You are immediately thrust into a fast pace of military discipline, the highest level of academics, a whirl wind of responsibility, and to BEAT NAVY! I remember as a plebe as I was just trying to survive cadet life and play football, an upperclassman yelled at me the first few weeks. Once he found out I was a football player he said, “Klein I don’t like football players. You ruined my Army-Navy weekend because we got beat. And you better not ruin my senior year by losing again this year.” I was taken back as I thought what do you care, you don’t play football. But I came to realize the game and who wins changes the experience of going to school at West Point. When the football team beats Navy it improves the daily lives and atmosphere of the entire school and enhances the experience. Bottom line, plebes lives improve because the upperclassmen can now graduate and say they Beat Navy their senior year. What other rivalry takes every member of the student body to attend the game. The game is woven into the fabric of every cadet and midshipman. You are playing for the entire cadet core, representing the Army stationed around the world. It’s more than a great rivalry. Beating Navy is what you breathe and live. Derek Klein was a defensive back for the U.S. Military Academy and is part of the Class of 1996. I still have dreams at night where I am getting ready for the Army/Navy game. The biggest pre-game rush is the flyover. The roar of Navy’s fighter jets and Army’s Blackhawk helicopters over the stadium is a once in a lifetime experience and moment of true humility. The fact that we are playing for our nation’s armed forces puts everything into perspective. It still gives me chills. We are a Navy family. Three of my brothers (Joe, Chris, and Dan) and I played for Navy football. Don’t tell anyone, but I lost all four years against Army, a few coming in the last seconds. If not for my brothers beating Army, that would still bother me to this day. I remember cheering them on in the middle of the ocean huddled over a television while serving on an aircraft carrier. The Army/Navy game symbolizes the best of what college football was meant to be. Everyone is playing for a higher purpose. There are no selfish, all-about-me egos. Just plain football with the toughest guys I have ever met on both sides of the ball. Both coaching staffs get it too, led by the finest leaders in college football - Coach Ken Niumatalolo of Navy and Coach Jeff Monken of Army. They understand that Army/Navy goes beyond football. The only hard part of the day is the memory of classmates and heroes no longer with us. Maybe that’s why I still like the flyover. Andy Person was a defensive end for the U.S. Naval Academy and is part of the Class of 1996.